Egypt knocked out Morocco to reach the Africa Cup of Nations semi-finals as substitute Mahmoud Abdel-Moneim prodded home a dramatic 87th-minute winner. Mohammed Salah had twice been denied by Munir Mohamedi, but prior to the goal Morocco missed a host of good chances. Aziz Bouhaddouz failed to connect with a cross from two yards out, before seeing a header deflected just wide. And Morocco defender Romain Saiss and midfielder Mbark Boussoufa were both denied by the crossbar. 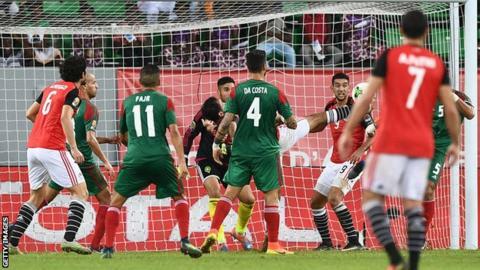 Egypt go on to play Burkina Faso, who beat Tunisia 2-0 in their quarter-final on Saturday. In Sunday's other quarter-final, Ghana beat DR Congo 2-1 to set up a meeting with Cameroon, who knocked out Senegal. Egypt - the most successful side in Africa Cup of Nations history with seven titles - are yet to concede a goal in Gabon on their return to the competition after a seven-year absence. But Morocco boss Herve Renard's bid to become the first manager to win three Africa Cup of Nations title with three different countries is now over. The Frenchman led Zambia to unlikely triumph in 2012, and won the 2015 title with Ivory Coast. On a pitch that has been criticised for its poor quality, his side created the greater number of clear opportunities to score but were wasteful in front of goal and were made to pay as extra-time loomed. From an Egypt corner that Morocco failed to clear, the ball dropped kindly to 22-year-old forward Abdel-Moneim, also known as Kahraba, who stabbed home the winner on the spin. Match ends, Egypt 1, Morocco 0. Second Half ends, Egypt 1, Morocco 0. Attempt missed. Faycal Fajr (Morocco) right footed shot from outside the box is close, but misses to the right from a direct free kick. Foul by Ali Gabr (Egypt). Omar El Kaddouri (Morocco) wins a free kick in the attacking half. Attempt missed. Rachid Alioui (Morocco) right footed shot from outside the box misses to the right. Assisted by Karim El Ahmadi. Substitution, Egypt. Saad Samir replaces Tarek Hamed. Nabil Dirar (Morocco) wins a free kick in the defensive half. Substitution, Morocco. Rachid Alioui replaces Romain Saiss. Hand ball by Mbark Boussoufa (Morocco). Corner, Morocco. Conceded by Ali Gabr. Goal! Egypt 1, Morocco 0. Kahraba (Egypt) right footed shot from very close range to the centre of the goal. Assisted by Ahmed Hassan following a corner. Attempt missed. Kahraba (Egypt) header from the centre of the box misses to the right. Assisted by Abdallah El Said with a cross following a corner. Corner, Egypt. Conceded by Medhi Benatia. Ahmed Hassan (Egypt) wins a free kick in the attacking half. Ahmed Hassan (Egypt) wins a free kick on the left wing. Mohamed Salah (Egypt) wins a free kick on the right wing. Foul by Romain Saiss (Morocco). Substitution, Morocco. Omar El Kaddouri replaces Aziz Bouhaddouz. Youssef En-Nesyri (Morocco) wins a free kick in the defensive half. Corner, Egypt. Conceded by Munir. Attempt saved. Mohamed Salah (Egypt) left footed shot from the centre of the box is saved in the top centre of the goal. Assisted by Abdallah El Said. Kahraba (Egypt) wins a free kick in the attacking half. Attempt saved. Aziz Bouhaddouz (Morocco) header from the right side of the six yard box is saved in the bottom right corner. Assisted by Hamza Mendyl with a cross. Kahraba (Egypt) is shown the yellow card for a bad foul. Karim El Ahmadi (Morocco) wins a free kick on the right wing. Essam El Hadary (Egypt) wins a free kick in the defensive half. Foul by Aziz Bouhaddouz (Morocco). Foul by Ahmed Fathy (Egypt). Aziz Bouhaddouz (Morocco) wins a free kick on the right wing. Attempt missed. Aziz Bouhaddouz (Morocco) header from the centre of the box misses to the left. Assisted by Nabil Dirar with a cross. Attempt missed. Manuel da Costa (Morocco) header from the left side of the box misses to the left. Assisted by Mbark Boussoufa following a set piece situation.